The Olympus Stylus TG-630 is an affordable and durable lifeproof digicam. Its compact size and styling looks and works like any other compact digicam, while its "tough" features allow it to survive everyday life. Overall it is a good sub-$200 digicam. Read more in our Full Conclusion. 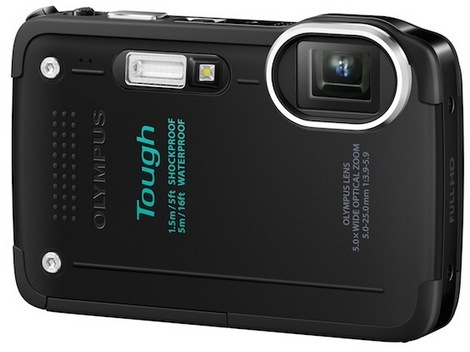 In January of this year (2013), Olympus announced a new entry-level tough series camera, the TG-630 iHS. While it may have a slightly smaller CMOS image sensor at 12-megapixels, is only waterproof down to 16ft and shockproof up to a 5.5ft fall, and doesn't have a crushproof rating, the TG-630 has a lot of great features from its more expensive siblings, the TG-830 iHS and the TG-2 iHS. These include the ultra-fast TruePix VI Image Processor and a plethora of digital features and effects like iAuto, Magic Art Filters, Beauty Make-up Mode. The Filters and Beauty modes are more artistic outlets, but the Enhanced iAuto mode actually selections between 34 different preset scene modes to optimize the camera for any shooting condition. Speaking of which, the TG-630 iHS also features Backlit HDR and Hand-Held Starlight modes, which a great for capturing pictures in darker conditions without having to pull out a tripod. Available in white, blue, red, or black, the Olympus TG-630 iHS sports a street price of $199.99. Click our Buy button at the top or bottom of this page to see the most current online pricing.